The Omaha DePorres Club had three homes; Creighton University, The Omaha DePorres Center and the offices of the Omaha Star newspaper. Each represented a phase of growth for the club and its members as they progressed from an emphasis on what club president Denny Holland called "sweet, kind things" to more confrontational activities. For its first year, the Omaha DePorres Club met on the Creighton University campus. 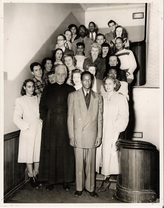 Early club members were mostly Creighton students and black Catholics from St. Benedict's Church. One of the first actions the club took was to visit pastors of nearby Catholic churches and ask why they did not allow black students to attend their schools. These visits resulted in the admission of black students, but they also brought the club to the attention of the president of Creighton, Fr. William McCabe. After ten months at Creighton, the club was asked to find a new meeting place. After the Omaha DePorres Club was asked to move their meetings off the Creighton campus, Fr. Markoe used his contacts in Omaha's African-American community to find a new home for the club - a vacant storefront on 24th and Grace. Calling their new home the Omaha DePorres Center, club members brought in speakers and held weekly forums on topics related to racism. The club distributed clothes to the needy, held dances and organized youth groups for local children. Members also contacted area businesses that refused to hire blacks, including the Omaha and Council Bluffs Street Railway Company. During the summer of 1949 they gathered 2432 signatures on a petition intended to convince the Street Railway Company to hire black drivers - marking the beginning of a campaign that would continue for the next five years. In July of 1950, the club began a boycott against the Edholm-Sherman Laundry. Located in the heart of Omaha's African-American community, the laundry refused to hire blacks to work in the front office or drive delivery trucks. The DePorres Club's boycott resulted in the hiring of black office workers at several area laundries. For a number of reasons, including the Omaha DePorres Club's inability to keep up with the $40 monthly rent, the Omaha DePorres Center was closed in September of 1950. After closing the DePorres Center in August of 1950, the Omaha DePorres Club met briefly at the North Omaha YWCA. In October the club announced that Mildred Brown, publisher of one of Omaha's black newspapers, the Omaha Star, had offered to let the club meet at her offices free of charge. The club intended their stay at the Star to be temporary - they would look for other meeting sites more than once - but the newspaper's offices would remain the club's home for the next four years. While they settled into their new home, the club continued their boycott against the Edholm-Sherman Laundry and their ongoing campaign against the Omaha and Council Bluffs Street Railway Company. They also organized successful boycotts that targeted the hiring practices of the Omaha Coca-Cola Bottling Company and Reed's Ice Cream. In 1954, under pressure from the combined forces of the DePorres Club, the Omaha branch of the NAACP, and the Omaha Urban League, the Omaha and Council Bluffs Street Railway Company finally agreed to hire black drivers for Omaha's bus system. The end of the bus company campaign marked the beginning of a five year hiatus for the DePorres Club. In 1959 Wilbur Phillips, who had been a club member in the early 1950s, resurrected the club to challenge the discriminatory hiring practices of the Omaha Public Schools. Phillips led the club during its year-long, but unsuccessful campaign to convince the Omaha district to hire additional African-American teachers - beyond the handful the district employed at the three elementary schools designated for black students.